ULTRA South Africa: Full Lineup! Gin & Tonic Festival 2016! Welcome back intrepid cosmonauts and merry pranksters! Time to, once again, put on your Earth Suits and return to the beautiful green meadows for the party of our lives. 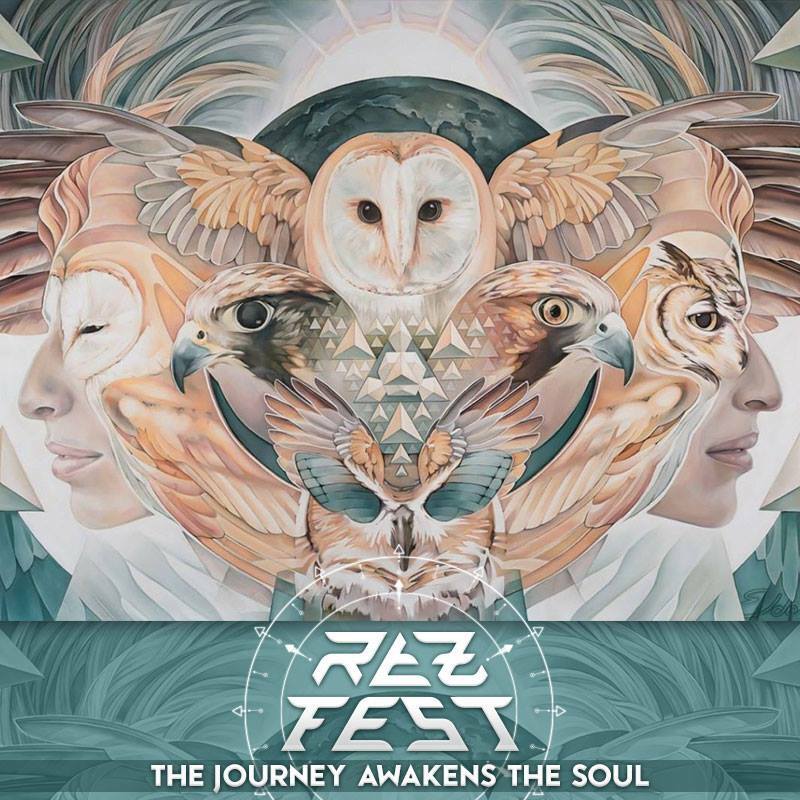 Rez Fest 2015 – 2016 will continue to build on the magic of past events with the four music arenas, characteristically magical décor, world class sound system and the perfect space for reckless abandon and general mayhem. Dreaming of a world where anything is possible we continue until it is at least probable. Get on the bus, party on. Always Further. As we move into 2016 the theme for this year’s Rezonance NYE Festival is the JOURNEY. The year 2016 is represented by the number 9 (2 + 0 + 1 + 6 = 9). In the Tarot The Hermit is the 9th trump or Major Arcana card. The Hermit reflects that you are engaging in a period of soul searching. You want to seek the truth at all costs. You desire a new direction in life and, as a result, have recently begun a journey of self-discovery and contemplation. There comes a point in life when we begin to question the status quo, knowing that there is a deeper meaning to life, and thus, we begin to search for it. During the hermit year questions of the spirit drive you on a journey to look within yourself to find your way. Line up times to be announced closer to the time. 30 DECEMBER WARM UP NIGHT . . Kick off the festival with full on beats and cranial tweaks on the Nova Stage from 16:00 until 03:00. PRIZM STAGE . . .
From filthy full-on night time beats to groovy melodic day time tunes, this stage is your one shop stop journey for feet pounding aural delicacies. As always we intend to bring fresh acts for all musical tastes. Party On. The Prizm Stage runs from 2 pm on 31 December 2015 until 5 pm on 2 January 2016 and is open for the duration of the festival. DELTA STAGE . . . This year at the Delta stage we’re stepping up the fun for a next level NYE! The line-up of has been carefully curated to ensure an outrageous and memorable experience! Expect to hear music by the best and freshest talents while dancing your way through to 2016; a cherry picked line-up of the best local electronic dance DJs and an international who knows the score will ensure there’s something for everyone to dance to. In addition, the team from It Came From The Jungle, Cape Town’s infamous D&B night, are joining us this New Year’s and taking control of the Delta Stage on the 1st Jan. The crew will transform the stage into a paradise, complete with fresh decor, design and the baddest basslines this side of the equator, all of which forms part of the countdown to It Came From The Jungle’s 10th birthday in 2016. Headlining the takeover is none other than Drum & Bass’ maker of anthems and dirty riddims, Ram Records’ DC Breaks, for the 1st time in South Africa. The Delta Stage will be open on 31 December and on 1 January from 16:00 – 03:00. NOVA STAGE . . .
Showcasing a variety of bouncy progressive beats and tasty techno, we welcome the new genres of electronic music into the fold. A troop of musical story tellers will take you on a journey like no other. The Nova Stage is open from 5 pm on 31 December until 8 am on 1 January; and from 2 pm on 1 January until 4 am on 2 January. CHILL TEMPLE . . . Featuring our homegrown chill out and ambient artists in a tranquil space the Chill Temple takes you on a journey of dubs, grooves and intelligent electronica. The chill temple is open from 6 pm on 31 December until 10 am on 2 January. We return to the lush green pastures at the beautiful historic Contermanskloof Farm in Durbanville. Gates open at 10 am on Wednesday 30 December 2015. Please do NOT arrive before this time. Arrive in style with Uber, Everyone’s Private Driver. We have partnered with Uber to get all guests to and from the event safely and in style! All new users can sign up here with the promotional code: RezFest15, in order to receive a free first ride up to R150. To request your ride, simply download the free application for iPhone, Android, Blackberry 7, Windows Phone, or visit the mobile site: m.uber.com. Uber is an on-demand service that seamlessly connects you with a private driver at the tap of a button. The entire service is cash free and the fare is deducted directly from your card on file. For questions, please contact Uber at supportcapetown@uber.com. CAR POOL . . . Please continue to support the car pool initiative and travel with 3 or more people per vehicle. In addition to being a more fun adventure this hugely reduced the carbon footprint of the festival. With the average 100 km car journey leading to over 10 kg of CO2 being produced, car pooling has a huge impact. Please do your part to reduce air pollution, congestion and fossil fuel use. In addition you split the fuel costs saving money on fuel as well as on car maintenance. DROP AND GO . . . Your driver will be given a Drop and Go Car Pass at the gate which allows you to be dropped as close as possible to the camping section with all your camping gear. GENERAL CAMPING . . . Camping facilities are as always included in the ticket price. Please team up with your friends to bring tents, camping gear and whatever else you need to create a nice camping spot. SACRED ARROW TIPI VILLAGE . . .
We are very pleased to welcome the Sacred Arrow Tipi Village back to Rez Fest. For those of you who don’t wish to pitch a tent and wish to reconnect with your tribal past why not stay in the magical Tipi Village. – Tipis must be booked for a minimum of two nights. – You will be able to park by your camping area. Please be sure to obtain a special car pass upon entry. A maximum of 2 vehicles per Tipi will be allowed. – Please bring your own sheets and bedding. – As with all camping, please do not leave valuables in the Tipis. – Cost of the Tipi is R890 per night. – In order to make a booking please email info@touchnature.co.za for a booking form. BELL TENT VILLAGE . . . The beautiful and spacious Bell Tent Village consists of 8 pre-pitched tents with mattresses, sheets, tables and more. This is ideal for people who are traveling from far and do not wish to hassle with lugging and pitching their own tents. The Bell Tent Villagers will be able to park their cars by their tent. – Each Bell Tent sleeps 3 people and costs R2 400 for the duration of the festival. – Each dome tent sleeps 2 people and costs R1 200 for the duration of the festival. GUEST HOUSES . . . CAMPER VANS . . . Camper vans and mobile homes are welcome and will be placed in a designated area close to the central hub of the festival. You will receive a special car pass for this and we ask you to not move around during the festival once you have parked. SPECIAL NEEDS . . .
As always we welcome special needs party goers to Rezonance and have allocated a designated area as close as possible (about 200 m) to the dance floor areas where you are able to camp and park. Disabled toilets will be provided and your friends may camp with you. Guide dogs are permitted. Please bear in mind that this is an outdoor festival site subject to rough terrain in areas. Let us know if you need a hand to make your festival experience more comfortable. Please arrange special needs access prior to the festival by emailing specialneeds@rezonancefestival.com. – R150 to use facilities for duration of festival. – Please note this facility can only be made available to a limited amount of people. – Shower hours: 6am – 10am & 4pm – 11pm to conserve water. – Please note: You need to get your Rejuvenation Station wristbands from the actual Rejuvenation Station and not from the gate. The Prema Shanti Healing Sanctuary is a group of professional healers who hold the sacred space at Rez Fest. Party goers can come here to take “a time-out” from all the festivities and receive some healing therapies. Whether you would like a specific treatment, a reading, want to regroup and chill, or just want to meet some new interesting folk, anyone is welcome to come hang out with us. The team consists of: Reiki healers, Yoga Instructors, Chinese doctors, Massage Therapists, Shaman, Astrologers, Numerologists, Meditation Facilitators, Sound journey therapists, Tarot Card readers, Herbalists, Spiritual counselors / teachers, Crystal Healers and more. Please note we have enough photographers and gate crew. – No glass permitted on venue. Please decant into plastic bottles before you come. Broken glass is difficult to clean and causes injuries to farm animals. – You may drink your own alcohol by your camp site but please do not bring to the dance floor area. – There will be credit card facilities at the bar only. – There will be ATMs will be available from where you can draw cash. – Look out for each other. Love and respect your trance family. Respect the venue and the neighbours. We are One. – Trust your instincts. Do not accept drinks in open containers. Report suspicious behavior immediately to security officers. – This is a strictly no under eighteen event. Green bar-coded IDs and drivers licenses will be asked at the entrance. Tickets are non-refundable if you are under 18 and have obtained a ticket. – No open fires anywhere under any circumstances. No gas braais. – No animals allowed. We love animals and want to keep them safe. The sound, the heat and the responsibility of taking care of them in such an environment means it is better to leave them at home. They will not enjoy it like you. Guide dogs welcome. – You will be able to charge your mobile phone for free at the Information Station. Charging is at your own risk. – Please leave your valuables at home! Unfortunately even though we implement several security measures outdoor events are easy targets for crime. Do not under any circumstances leave any valuables in your tent. Ensure that you are aware of where your wallets, cell phones and keys are at all times – best to attach these items to your body so that you don’t lose them. Please take responsibility for your waste and live by the Leave No Trace set of principles. It is up to each festival goer to put their refuse in the bins provided. There is no excuse for littering. Be considerate of the other people at the event, respect the beautiful farm, be the beautiful conscious person that you are. Be The Change. All refuse is processed for recycling. Please pick up rubbish when you see it laying around EVEN IF IT IS NOT YOURS. DONATION DROP BOX . . There will be a donation box at the gate. If you have anything to spare, no matter how small, please bring it along. Tins of food, old clothes, old books – reduce, reuse, recycle. Mutha FM will be broadcasting the outdoor surround sound Rez Fest beats, taking you into the New Year LIVE from the Prizm Stage, so be sure to bring an FM radio for extra audio pleasure on 90.8 FM stereo – TUNE IN ON LINEmuthafm.com for Rezonance updates. Please note this is a strictly over 18 event. Green barcoded IDs or drivers licenses will be required. Unfortunately certified ID copies will not be acceptable due to high incidents of fraud. Cash sales only at the gate. TICKET PRICES FOR FULL EVENT PASS. ♡ . PLEASE NOTE THAT WILDFIRE’S NUMBER IS NOW 081 736 4930. PLEASE DO *NOT* CALL THE LANDLINE. There are no day passes available as we are unable to remove people off site at the end of the day. The gate price does however drop on 1 Jan and 2 Jan. Price drops will be announced closer to the time. – No fires or gas braais. – No animals except guide dogs. – No alcohol in festival area. Alcohol only allowed by your campsite. – No swimming after dark. – Right of admission reserved. Right of admission reserved. Participation in the event is entirely at own risk. The organizers accept no responsibility whatsoever for injury, death, loss or damage of any nature to persons, vehicles or belongings, even in the case of negligence. Due care has been taken to make this event safe and secure. We resonate with the universe. Every breath we take is part of the universal breath and every breath we give out is our contribution to universal life. This is a time of spiritual awakening and transformation, time to align with the vibrations of Love and Light. The beginning of a new Consciousness, the reconnection to your Cosmic Family. Now is the time for transmutation. Be the change. Click attending on the event page: [here]. Comment on the blog post below and tell me which artist you’re most amped to see LIVE? Please make sure you add your correct email addy, so I can get hold of you if you WIN! Keep it local with Headroom and Broken Toy! Bruce. Old school is the beat of Summer! Please help me win this awesome prize? Hiyarant. From the valley, where we reside! Looking forward to PH Fat!!! Antispin from Internationals and Headroom from locals! Hoping to see PH Fat! Broken Toy. My all time favourite. LOW DOWN AND DIRTY! So AMPED for SCORB and Psyams! Glitch, Broken Toy, Psyqlopz, Scorb and Materia! Please make my 2016 start on the best note! Keen to see Headroom LIVE! Headroom, Bruce and Loud boss! Keen for everyone on the electro stage!!! Coming through for the morning of the 1st. I’ll have to see the line-up times, but Bruce is one of my all time favourites! Hiyarant and Antipsin please Mr Cape Town!!! It has to be Broken Toy! Coming in hot in my UBER and looking forward to having it with my friends to SCORB! China, I am there for all the Internationals. There are almost 10, that’s just unheard of! Oh baby, please can I win this. Money is low after the hectic season, and I’m like the biggest Broken Toy fan in SA! Please, PLS can you make me a winner Mr CPT! Always enter and haven’t won anything yet. LOVE HEADROOM!